• Environmental consciousness and education activities, such as: regional conferences for actors and groups involved, painting and photography contests and travelling expositions, bird workshops in educational centres, educational bird ringing conferences, etc. Jay (garrulus glandarius) specimen in hand. • Training activities: training of ecotourism and birdwatching guides, training directed at people in the rural tourism business. 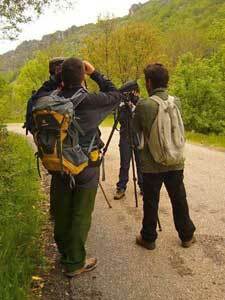 A course to spread knowledge about the bird species in the Cuatro Valles region and good environmental practices in tourism. • Infrastructure: signage for birdwatching paths in the individual regions. Hikers walking along one of the birdwatching paths. • Promotion and marketing: multilingual promotional website, publication of materials, infomercials, participation at fairs, trips for tour operators and media. 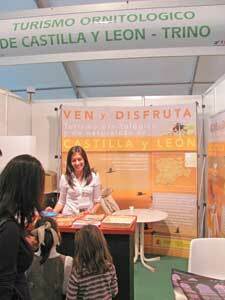 TRINO at the International Birdwatching Fair held in Villarreal de San Carlos.